This article seeks to identify the factors that have impacted the adoption of ISO 10303, the Standard for the Exchange of Product Data (STEP), within the UK Ministry of Defence. The analysis presented in this article is based on Diffusion of Innovation (DOI) Theory and the theory surrounding the Economics of Standards. Using a case study approach, the results indicate that several DOI and economic factors have impacted the adoption of STEP. These findings offer insights into some of the technological, organizational, and environmental influences on standards adoption. It is envisioned that these results will make a contribution towards the body of knowledge surrounding the factors and barriers critical to the adoption of standards like STEP, and enable more effective development and adoption of these standards. 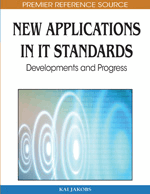 Standards have been in existence since the beginning of recorded history (Krechmer, 1996). Some standards were developed as a consequence of man’s desire to harmonise his activities, and other standards emerged in response to the needs of an evolving and increasing complex society, and the waves of human progress and technology. This is demonstrated in the development of standards to enable the exchange of product data. As Kemmerer (1999) points out, “the evolution of exchanging product data in an electronic form arose in parallel to the creation and use of computers. As advances in computational and communications technology occurred, emphasis shifted from algorithm/programming to data exchange.” The use of these standards to facilitate product data exchange offered a solution to the high backend costs associated with the use of converters for point-to-point customised data exchange, and allowed product data to be shared and utilized without recreating applications or data sets (Albrecht, Dean, & Hansen, 2003). Over the years, there have been a number of de jure and de facto data exchange standards in use. However, many of the early standards, for example, the Initial Graphics Exchange Specification (IGES) and Electronic Design Interchange Format (EDIF), were bounded by their restriction to graphical and geometrical information (ProSTEP, 2004). Therefore, in order to override this problem and curb the development of a multitude of standards, work began in the mid 80s on developing a new overarching standard known as ISO 10303—Standard for the Exchange of Product Data (STEP). STEP built upon the lessons learned from the previous standards and had the advantage of not just focusing on basic descriptions of what data are, but on the meanings of data and how data relate to each other (Kemmerer, 1999).